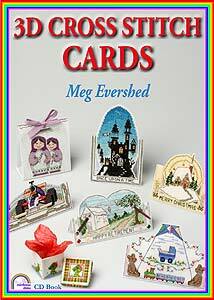 Meg Evershed, the Nutmeg Company's designer, wrote her first book "3D Cross Stitch" in 1999. More recently she has written a new booklet which aims to answer all the questions regularly asked about stitching on paper. She has also written a CD book, which contains 40 new projects, ranging from greetings cards to invitations and gift bags and boxes. 3-D Cross Stitch Cards, the new book published by Rainbow Disks, is now available. The book contains 40 new projects, ranging from greetings cards to invitations and gift bags and boxes. All the designs are stitched on perforated paper. Rainbow Disks CD books are readable on a PC or Mac, using Adobe Reader, which is available free of charge. You can print out charts, shopping lists or whole sections if you wish, and zoom in to see greatly enlarged detail on the high quality images. Links take you straight to the suppliers' websites, or to another section of the book, and bookmarks and thumbnails allow rapid navigation - from projects to techniques and back again. An instruction video demonstrates basic techniques which are also fully covered in the text. You will find Christmas cards, cards to celebrate special events and cards for personal messages, plus ideas for adding matching gift bags or boxes, gift labels and more. The book has been reviewed by The Sewing Directory who said: "...the cards are truly stunning... If you are looking to make cross stitch cards I think this book is ideal, and the video clips would give you more guidance that you would get from a paper book. I find it always helps to see someone else doing it."